The Green Fleet represents the world’s first eco-friendly HPMO (High Performance Mobile Office®) developed by the Miletus Group for Jobsite Mobile Offices. Jobsite Mobile Offices will feature the new Green Fleet HPMO at the BCA Construction and Design Expo – September 28-29, 2011 – Memorial Coliseum Exposition Center – Fort Wayne, Indiana. The 1260 HPMO will be located at the show entrance and will be fully furnished, manned, and powered. 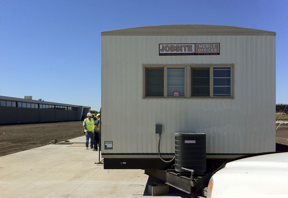 Designed by the modular architecture specialists at Miletus Group, Inc., the HPMO installation is a pinnacle part of Jobsite Mobile Office’s 40th anniversary celebration taking place at the show. “We are proud of the work we did in partnership with Jobsite,” states James B. Guthrie, AIA, Miletus Group president. “The revolutionary HPMO uses at least one third less energy than conventional mobile offices. Some customers are reporting energy savings of well over 50%. This new thinking in mobile office design also includes a high level of recycled materials and is 100% recyclable at the end of its long life cycle. Our team spent a great deal of time analyzing the best sustainability practices in the building industry and then found ways to apply them to the mobile and modular office-building sector. Little will appear changed to office occupants in terms of the general layout, construction, and convenience of the high performance units. However, noticeable differences will appear in the form of substantially lower utility bills and significantly higher levels of comfort during hot summer and frigid winter months,” says Guthrie. The Jobsite Green Team celebrates their 40th Anniversary at the BCA Construction and Design Expo. The Miletus Group designed the innovative HPMO to be featured at the Expo. Miletus Group Takes First Place Honors at MBI 2011 Awards of Distinction. Miletus Group took home first place honors in the Modular Building Institute (MBI) Awards of Distinction. The Awards of Distinction is the largest international contest of mobile and modular buildings. The program seeks the best of the best in commercial modular building entries submitted by MBI member companies. A notable panel of judges from the architectural and building community reviews them. Judges look for exceptional projects in the areas of architectural excellence, technical innovation, efficiency, and length of project delivery. Miletus Group’s Jobsite project won in the Temporary structure category with a highly sustainable mobile field office and used at the nation’s first LEED™ Platinum transit facility. This singlewide mobile field office, built on a standard 1260 frame, provides the same functional and mobility advantages as a traditional mobile field office – but with clever design and technical innovations that add up to a huge reduction in the client’s fleet’s overall carbon footprint. This unit represents the culmination of two years of research and development into how to apply the most advanced green building measures into a production line and a fleet of lease fleet units. While the unit does include the latest in low energy lighting, HVAC equipment and related technologies, the real performance enhancements come from its sophisticated thermal skin. First, the unit has been designed for ultimate production ease and efficiency to manufacture. Second, the material choices were selected for their durability, providing a long-term life and a higher than standard ROI. Third, virtually all of the materials used in the unit are recyclable. This makes decommissioning more cost effective, requires no land fill space, and lowers the end of life energy use and thus its overall carbon footprint. Fourth, the day-to-day performance of the unit, due to its efficient systems and enhanced skin, greatly reduce the operational energy use by up to 70% of a standard unit when all end-user options are incorporated.